Whip up a batch of caramel apples for a family treat. 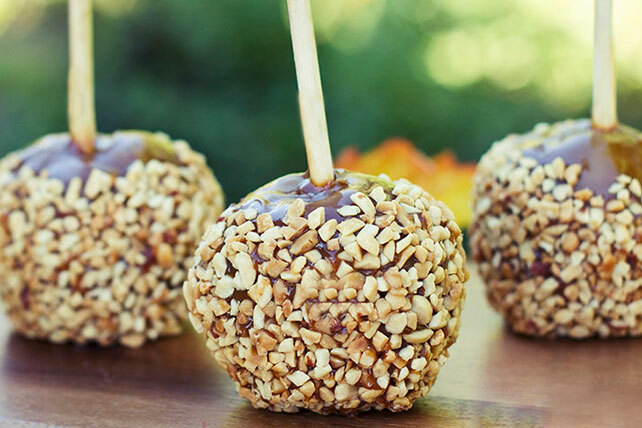 Crisp apples are dipped in melted caramel and roasted peanuts - how can you go wrong with this fall classic? Insert wooden pop stick into stem end of each apple. Cover large plate with parchment paper. Microwave caramels and cream in large glass microwaveable measuring cup on HIGH 2 to 2-1/2 min. or until caramels are melted and sauce is smooth when stirred; cool slightly. Dip apples 1 at a time, into caramel sauce, turning to evenly coat each apple. Let excess caramel drip off. Press nuts into caramel. Place on prepared plate. Refrigerate 1 hour or until caramel is firm.